I would like to share further details about the research project that I completed and published for my fellowship with the Educational and Instructional Technology Research Center. Please let me know about your comments and thoughts. Guiding Purpose: Have you as a chair or committee member of doctoral learning ever wondered what research-based competencies you need in aiding your dissertation learners? Have you as a dissertation learner wanted to tell your chair and committee members what competencies you would like them to have? Literature Basis: In order to answer these questions, I devised a study based on competencies for dissertation chairs by Schichtel (2010). There are numerous qualitative studies investigating the perceptions of learners and mentors in online educational doctoral programs in regards to satisfaction, expectations, and importance (Bolliger & Halupa, 2012; Kumar et al., 2013) but little research has been conducted in the narrower scope of the culmination of the process-the dissertation (Brill, 2014). This is necessary because if the doctoral candidate perceives a different importance level than the chair, then a disconnect will occur between what will be developed by the chair and what is desired by the doctoral candidate. Schichtel’s theoretical competencies developed by meta-analysis are continuous learning, social interactions, cognitive ability, teaching reflectively, communication, managerial skills, and technical skills. 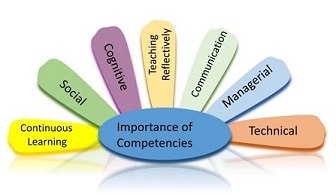 What are the most important mentors’ competencies from the learners’ perspectives? What are the most important mentors’ competencies from the mentors’ perspectives? To what extent is there correlation between mentors and learners’ perceptions of importance rating of each competency? Sample. Members of social media groups of professors and doctoral students were the population from which mentors and learners’ participation were recruited for the voluntary survey participant group of 68. A sample size of mentors and learners combined of 68 was calculated from G*power 3.1.9.2 calculator software with an effect size of 0.3, power of 0.80, and alpha set at 0.05 (Cohen, 1992). Process. The survey was created and reliability and validity ascertained. Invitations to participate were distributed via social media group postings to doctoral students and mentors of higher education. Distribution of the survey occurred via an online survey host. Data Analysis. Data was collected and SPSS used to calculate the difference in importance means for each of the six competencies. Relationships between learner ratings of importance of competencies and mentor ratings were ascertained. Percentages of importance ratings by mentors and learners were used to determine the most important interaction competencies in the first two research questions. Spearman’s rho, a nonparametric measure of relationship, was used to investigate the hypotheses as a linear relationship cannot be assumed and the measures provide ordinal data. Findings: Three competencies were found to be highly important to learners and to mentors. These three are social competence, cognitive competence, and the competence of continuous learning. In addition, the communication competence was found to be highly important to learners. The remaining two competencies, teaching reflectively and managerial, were found to be important to learners. None of the competencies was viewed as being unimportant by learners. Four competencies were found to be highly important to mentors: social competence, cognitive competences, continuous learning competence, and teaching reflectively. Managerial competence and the communication competence were found to be important to mentors. None of the competencies was viewed as being unimportant to mentors. Strong to moderate correlations were identified between learners and mentors’ perceptions of competencies. Particularly, there were strong correlations between learners’ and mentors’ perceived cognitive and social competencies. Managerial and communications competencies were found to moderate correlation between learners’ and mentors’ perceptions. No significant correlation was found between learners’ and mentors’ perceptions about importance of teaching reflectively and continuous learning. There were no competencies determined to be unimportant to learners or to mentors. This may mean that all competencies supported in Shichtel’s (2010) model be considered to be important to the scope of teaching and learning in the dissertation process for mentors and learners and thus validity of the model is upheld. Conclusion: As best practices, it is recommended that the four competencies, social competence, cognitive competence, competence of continuous learning, and communication competence, found to be highly important to learners, be set as the basis for requirements for mentors in the online dissertation process. Through organizations of higher education formulating faculty development founded on a framework of the important competencies that need to be exhibited, mentors may understand that what is important to learners may be slightly different than what mentors think is important.